Australian author Robert Bruce offers readers a methodology to improve bodily functions, mental abilities, and spiritual relationships, arguing that the only way to really get in touch with yourself is to first get in touch with your energies. 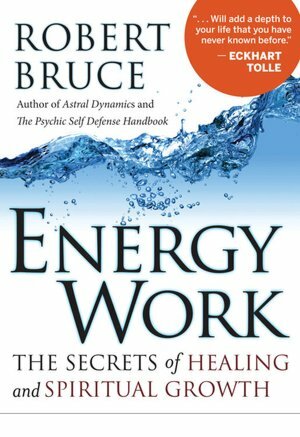 In Energy Work, Bruce focuses on the utilization of the unique energies found within individual human's bodies. He states that our common goal within humanity is to “become a healthier and more dynamic human being” which can be done primarily by utilizing and stimulating the human energy body (Bruce, 1). In order to do so, we must recognize the presence of energy blockages which Bruce suggests are analogous to a river. Just as a river may become polluted, have its flow disrupted and appear, at times, muggy, so can the energy channels within our body. It is the clearance of energy channels and the preservation of energy flow that brings to light Bruce’s acknowledgement of the importance of grounding and physically making connections within the earth. Grounding, Bruce proposes, can be explained as simply as an attempt to awaken our bodies “from dormancy” (Bruce, 111). If we fail to ground ourselves we may experience problems ranging from lethargy and depression to anxiety and other physical ailments. Bruce explains that today, more than ever before, it is important to revive our bodies and explore the naturally-occurring energies within us. As he explains, “We live in a fast-paced, modern world that is highly stimulating to the mind and senses” (Bruce, 112). While the basic idea of information and knowledge is imperative for growth, the overstimulation, as Bruce explains, can become problematic. An onslaught of information may create an overstimulation of both our minds and our energy centers. It is our responsibility, as the sole proprietor of our bodies, to balance these energies and maintain healthy, effective functioning. Despite his primary focus on the mind and spiritual recognitions, Bruce recognizes the importance of the physical body and our skin in the process of energy balancing. As Bruce explains, “Bare, well-cared-for skin provides optimal conditions for a healthy, natural flow of energy” (Bruce, 123). As the most outer part of our bodies, most in contact with the world around us, skin acts as a tool for transferring and maintaining proper energy between ourselves and the earth. Bruce notes, as has been identified over many years, that our modern-day source of knowledge is based largely on information gained from “heavily grounded agricultural societies” (Bruce, 112). By grounding and connecting ourselves with the earth, we establish a natural connection needed for the exchange and maintenance of our body’s energies. Without the implementation of these practices, we fail to sufficiently care for our bodies. “The feet are major conduits into the energy body. This is where energy is exchanged with the planet. Toxic energies drain from and fresh energies flow into the energy body there” (Bruce, 126). This is an interesting book, and many readers might find it valuable. Personally, I felt there was a 'be afraid of the external world' vibe that turned me off. As well, the writing is florid, using 15 words to say what could have been said in 5 (see my quotes from the text, above).